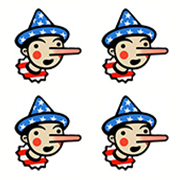 The president has a shiny new talking point — that the gross domestic product grew 3.1 percent in 2018, after adjusting for inflation. That’s a defensible number, because there are two ways a GDP figure for the year can be calculated. But it starts to get misleading the way he frames it — that it’s the best result in 14 years and that the news media wrongly reported it as 2.9 percent. This is a traditionally reported number for annual GDP growth rate. It compares how many goods and services the United States produced in 2018 ($18.6 trillion) with the number for the previous year ($18.1 trillion). We checked, and Trump’s CEA used 4Q/4Q in 2018, so this was not a sudden switch designed to make the boss look good. Jason Furman, who led the CEA under Obama, has also advocated that 4Q/4Q is a better measure for growth in a particular calendar year. He noted, for instance, that annual average growth was reasonably high in 2008 (even though the economy imploded) because it included data from 2007, when the economy was good, and annual growth was reasonably low in 2009 (despite the economy starting to recover that year). The Commerce Department’s method of calculating GDP shows the GDP sagging just -0.1 percent in 2008 and -2.5 percent in 2009, compared with -2.8 percent in 2008 and +0.2 percent in 2009 under the 4Q/4Q method. But while 4Q/4Q corresponds to an annual calendar, it does not tell you when a president had his peak growth rate — or his nadir. Trump faulted Obama for being the first president to never break 3 percent on an annual basis — that’s under the year-over-year measure used by the Commerce Department — but under that method he simply has tied Obama. Trump also has not exceeded 3 percent. Now that Trump is citing 4Q/4Q, that means the relevant comparison would not just be 4Q/4Q but other quarter-over-quarter calculations. The economy under Obama hit its peak in 1Q/1Q 2015, when it grew 3.8 percent. Obama exceeded 3.1 percent on two other occasions, as well. (His best result for 4Q/4Q was 2.7 percent, in 2014.) Obama’s nadir was reached in 2Q/2Q 2009, when the growth rate was -3.9 percent. Yet Trump is telling audiences “this hasn’t been done in 14 years, maybe more than that, but 14 years.” That’s because he’s going all the way back to Q4/Q4 2005, when that particular quarter-to-quarter measure reached 3.1 percent. The chart below shows how stronger periods of sustained growth for a period of a year were reached in 2015 and 2010. Trump’s CEA offers a compelling case that 4Q/4Q is a better gauge for measuring GDP growth within a calendar year, and it acknowledges that the 2.9 percent growth rate is the measure for year-over-year growth. But such nuances appear to have been missed by the president. If he just stuck to the numbers, without the braggadocio and press bashing, he’d be on more solid ground. The economy is doing well enough that there’s little need to spin the data further. We’re offering a blended rating here. 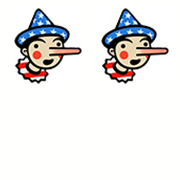 It’s accurate to cite 3.1 percent growth for 4Q/4Q, but the accusation against the news media is worthy of four Pinocchios and the claim of best record in 14 years is worth two.